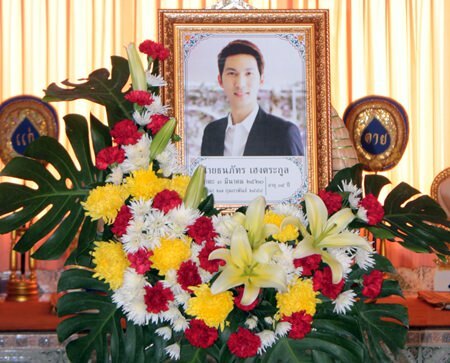 Top local officials and former national politicians paid their condolences to a former Education Ministry advisor and head of Sophon Cable Television at the funeral for their son, who died at age 35. Former Culture Minister Sonthaya Kunplome presided over the bathing ceremony for Thanapat Hengtrakul, son of Pheu Thai Party member and Sophon CEO Chanyuth Hengtrakul, Feb. 27 at Chaimongkol Temple. Paying their respects were Pattaya Mayor Itthiphol Kunplome, Nongprue Mayor Mai Chaiyanit, city council members, former MP Poramet Ngampichet, former Mayor Niran Wattanasartsathorn, police and business leaders. Thanapat, a deputy managing director at Sophon Cable TV, died of cancer Feb. 27. A graduate of the National Institute of Development Administration and the Western International University in the United States, he returned to Thailand to help run the family cable business. 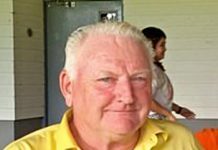 He was said to be friendly and well-liked and an avid sportsman, enjoying running, badminton and jet-skiing. 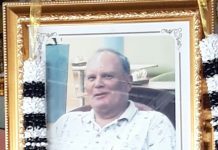 His diagnosis for liver cancer came late in the disease’s development and as a total surprise, the family said. Funeral services continue through March 7.